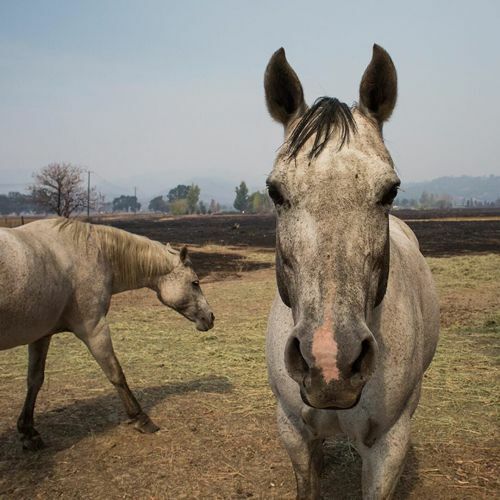 "A #horse with a singed mane and whiskers from the Valley Fire near #Middletown, California on Tuesday. When the #fire blew up in the rural area 100 miles north of San Francisco last weekend, many residents fled with only the clothes they were wearing. Along with their homes and possessions, they were forced to leave animals — pets, as well as hundreds of horses for breeding or show, goats and sheep that are financially important in a farming-centered economy. Horses have been found wandering down the highway, dazed disaster survivors with cuts and scrapes from the fences they broke through or jumped. Photo by Talia Herman on #nytassignment." By nytimes on Instagram.